On the night of November 26-27, 1940, the Romanian Iron Guard massacred sixty-plus political prisoners of the pre-fascist regime at Jilava — the Jilava Massacre. This incident marked the interregnum of the National Legionary State, and the friction between the fascist Legionaries under Horia Sima and Prime Minister Ion Antonescu. An authoritarian right-wing dictatorship by any standard, but like any polity it had its own internal conflicts. Of moment for this date: the detention of people whom the Legions considered implicated in the execution of fascist martyr Corneliu Zelea Codreanu two years before, as well as miscellaneous other undesirables who had prospered under the abdicated King Carol II. Antonescu, who had a thing about rectitude, proposed to ornament these men’s inevitable deaths with the formalities of investigation and trial. Long story short, Sima and the Legionaries didn’t trust Antonescu; when Antonescu ordered some of the prisoners transfered to a different prison, the Guard refused — and when replacement jailers were consequently slated for the Guard, the Guard took matters into its own hands by slaughtering its charges this night. By the following January, the conflict between the National Legionary State factions came to a head. 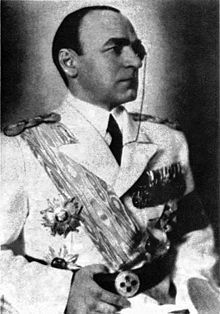 With the support of the Third Reich, Antonescu mastered the Iron Guard, took control of the state, and sent Sima into exile. And he did indeed punish — up to and including execution — several of the Guard members involved in this date’s massacre. On the other hand, as a prize for serving as wartime Prime Minister of an Axis-aligned state, Antonescu himself was shot for war crimes not far from Jilava Prison in 1946. Sima, on the other hand, had a few in absentia death sentences, but checked out comfortably in Madrid at the age of 85.